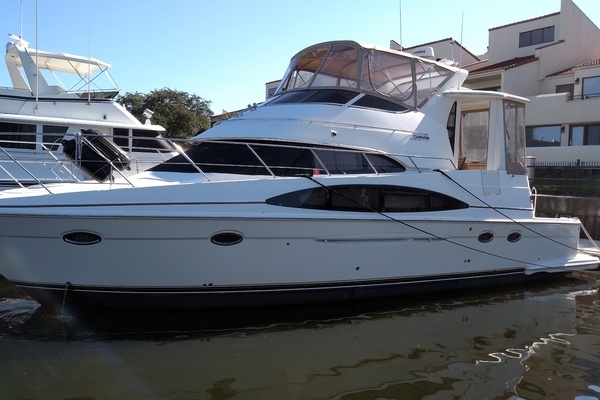 If you are looking for a proper boat, then you must see Cracker Jack. A rare walk-around Krogen 44, perfectly equipped by a former sailor. Her capable hull form will take you anywhere you want to go, her thoughtful outfitting will get you there in style. Where will she take you? Hull, Superstructure, Decks all made from single-piece female molds. All molds are vacuum-bagged. • Hull construction includes use of USA-made Cook gelcoat. Hand-laid Knytex fiberglass with closed-cell PVC sandwich core used in topsides. Solid below the waterline with blister resistant vinylester resins. • Aramid (different brand name then Kevlar) reinforced hull for impact protection. • Watertight bulkheads and hatches including “crash” bulkheads fore and aft and Freeman deck hatch forward. The saloon is entered from the fully covered aft deck through a weather-tight welded aluminum door with Phantom retractable screen. The saloon is bright and inviting with large opening windows port and starboard and an opening window in the aft bulkhead. To starboard is an L-shaped settee with hi-lo teak dining/coffee table. The port side has room for two comfortable chairs. Forward on the port side is teak cabinetry with book shelves, storage cabinets and pantry. The "U-shaped" galley is forward of the saloon on the starboard side and offers generous Corian® countertops and a Corian® double sink. There is ample storage in multiple cabinets and drawers. The open faced feature allows the chef to be included in the social activites while preparing gourmet meals. The master stateroom is forward, and is bright and airy. 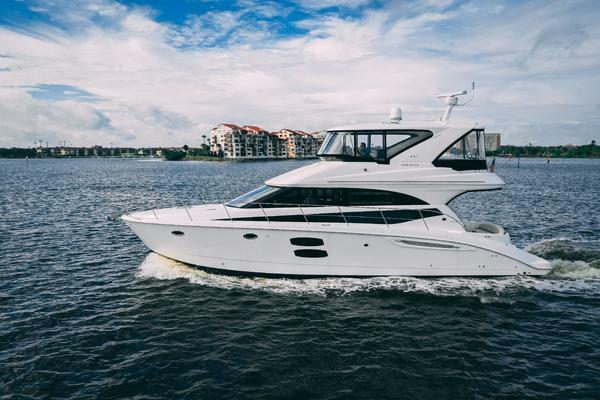 There is a queen-size island berth with voluminous storage underneath, port and starboard hanging lockers, mirrored dresser with an additional 8 drawers of storage, 4 stainless steel opening ports and an overhead hatch. The guest quarters / office den are on the starboard side aft of the master stateroom. Included is a convertible settee, desk, pullman berth, hanging locker, book shelves, 2 opening stainless steel ports and a convenient engineroom access through an insulated dogged door. This space is set up for your use as a den/office and designed to convert to make your guests comfortable when they are aboard. The head is opposite the guest quarters and features a separate stall shower, fresh water VacuFlush head, mirrored vanity with Corian® countertop, medicine cabinet, linen storage and 2 opening stainless steel port. Forward of the head are the Asko washer and dryer, easily accessed from the companionway. Owner's personal effects and art work.